Smart Presentation for Consultation-intensive Products. With the pCon.box, you can design the perfect room solution for your customers as well as have additional production information on hand directly at the point of sale. 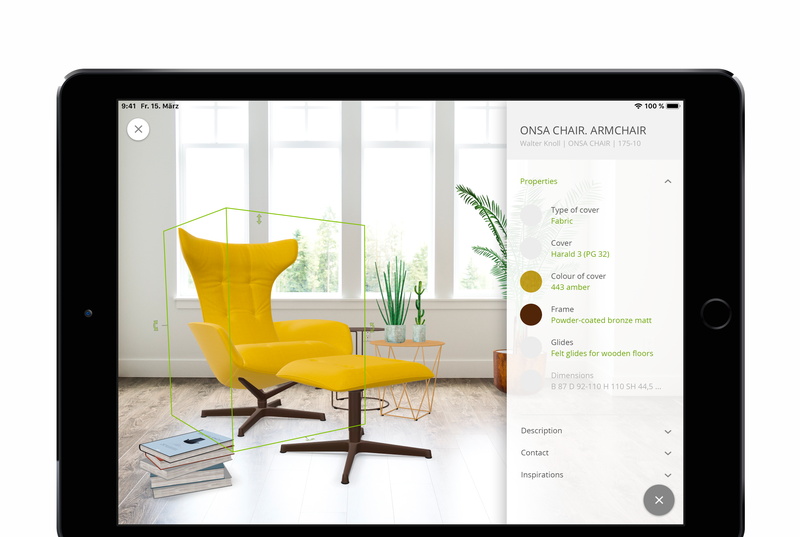 With AR technology, 3D interactions such as zooming in on details and live configuration of objects you create lasting customer experiences. - Clean, intuitive and well sorted. The redesigned user interface of pCon.box brings main features into focus and ensures an overall better user experience. - Know more, consult better. Manufacturers have the opportunity to provide valuable additional product information. Retailers and architects thus benefit from high-quality product brochures, pictures, certificates and much more in conversation with the customer. - More efficient through templates. A project can now be converted to a template, which is then used as a template for presentations – the original remains unchanged. +++ The download is worth it - we’ll reveal more tomorrow! This entry was posted in Presenting and tagged Appdate, Augmented Reality, pCon.box. Bookmark the permalink.